Today was a little hazy. I woke up around 10:30 am and had a relaxing breakfast of bread, cheese, and ham. I washed it down with some coffee and apple juice. Stefanie had already left for work and the kids were in kindergarten. Volli had a few calls to make, so I worked in his living room writing my blog and catching up on the days events through social media and news sites. At noon, Volli and I laced up and went out for a quick run around the block. He took me through an old rail yard that has been transformed into a park. It was very cool, and there were a lot of people out riding their bikes and just enjoying the weather. It was rather hot at times as the sun was directly above us and there wasn't much shade along our route. Loved it! We arrived back at Volli's flat and began our day with some Johnnie Walker. 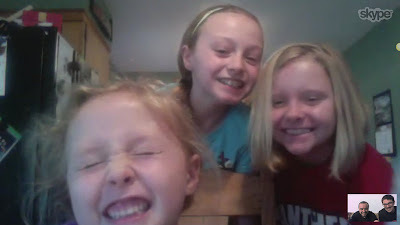 Around 1:15 pm, I realized that the girls would be getting ready for school, so I called them via Skype and had them turn on the computer so we could do some video chat. It was exactly what I needed! Jazzy was getting her hair straitened by Jennifer, Daizi was eating cereal, and Lizzie was simply awake for moral support since she had and orthodontist appointment at 9 am and wasn't going to be getting on the bus with her sister. Volli and I talked to them for about 5 - 10 minutes and then we let them finish getting ready for school. The plan for today was to pick up Henry at kindergarten and meet with Johannes (Volli's childhood friend) and his son, Emil, at the Berlin Zoo. We spent 3 hours at the zoo simply walking around and killing time. The zoo was right in the middle of the city, but it felt very "green". We went from attraction to attraction and I snapped a lot of pictures so that I could share them with my girls when I get back home. At one point we found a comfortable table in the center and began drinking beers while Henry and Emil ran around. It was a very lazy day for us and we had nothing else to do but enjoy each others company. I really enjoyed my time here. From the zoo, we came back to the house to help Stefanie get the kids to bed. Around 7:30 pm Volli, Stefanie, and I all headed out for the evening to meet with another one of Volli and Stefanie's childhood friends for dinner. We met up with Martin at a local restaurant and enjoyed an evening of more beers and conversation. I was able to taste many of southern Germany's dishes. They were delicious and I really enjoyed my time with them. Martin was a CTO of a local software company, so we were able to talk about a lot of things that we had in common relating to software. It was great! We arrived back home around 11 or 11:30 pm and Volli and I made our way out to the terrace for more Johnnie Walker. :) Volli went to bed and I spent the evening configuring my computer with the latest version of Ubuntu Desktop until I passed out. Today was a great day!